Our very traditional Christmas dinner is over… And thanks to the Colonel and a local cake shop, it was a smashing success. But where were we? Ah yes, the Colonel. 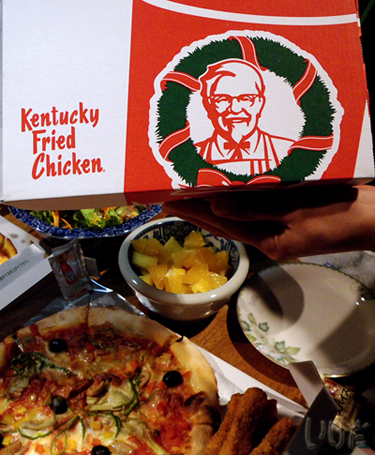 You see, it’s traditional in Japan to eat fried chicken on xmas day. Why? Simply put, turkey is/was too much of an assault on the very genteel Japanese taste buds, not to mention the fact that it’s pretty much impossible to cook a proper turkey in a standard Japanese oven. So, back in 1974 KFC got the brilliant idea to use this fact to their advantage and have themselves a merry, little xmasy fried chicken marketing campaign. And as with all “new” things in Japan, there were only two possible outcomes – come January 1975 it was going to either fade into obscurity or catch on in a big way. There is simply no middle ground when it comes to trends in this country. And as we all know by now, the campaign has caught on, big time. So big that now, only some 30-odd years later, eating fried chicken for xmas is considered “traditional”. 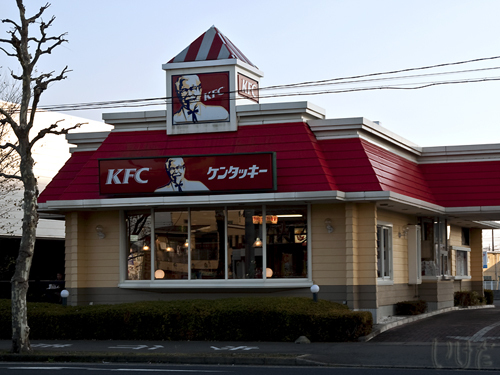 Other retailers have jumped on the fried chicken bandwagon and if you’re not a fan of the Colonel, you can get your xmas dinner from just about any food purveyor, from a local grocery store to the Hotto Motto bento seller. Our “traditional” Japanese xmas dinner also included pizza and cake. “Traditionally” it should have been a strawberry cake, but I am very pleased to say that chocolate cake is gaining ground too. 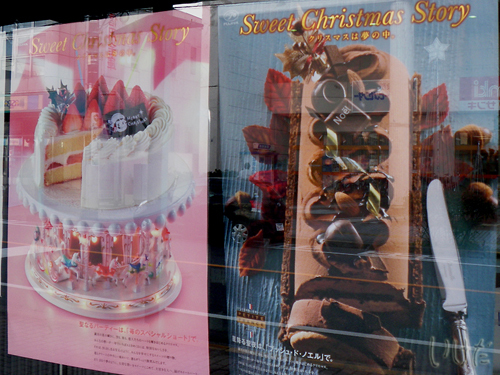 b) nobody wants to slave in the kitchen, especially since for 99% of Japanese xmas day is just an ordinary work day. And why do we put candles on top of a Christmas cake? Well, it might be not baby Jesus’s birthday today, but it IS somebody’s birthday, so why not? And now, if you excuse me, I need to look for some indigestion medication.